With the days noticeably shortening, I’ve been thinking of plants that I can grow through autumn and winter. In particular, of cold-hardy lettuces. Sown now, many will be ready in only a few months. Others, which are particularly tolerant of cold temperatures, mature over a longer period for a midwinter or early spring harvest. My aim is to maximise my small container garden yield by growing for as much of the year as is humanly – perhaps I should say horticulturally – possible. If, like me, you’ve already pulled your spring and summer crops, or will be doing over the next few weeks, then now is the perfect time to sow. I’ve recorded the varieties that I’ll be growing in the table below. Time until harvest is a rough approximation because growth will get gradually slower through the darkening months, coming almost to a stop through mid and late winter. The fast-growing loose-leaf and butterhead varieties, sown now in pots, will be ready for a late autumn harvest, though you may need to offer some protection (see below) from late September onwards if it gets cold (here’s hoping for a late flush of warm weather). Slower growing types, particularly Cos and Crisphead varieties, will be ready either by early winter (December and January) or the start of spring. Spring varieties will go dormant through the deepest winter months before resuming growth once the worst of the cold weather has passed. Another benefit of growing an autumn crop is that you can reuse the soil in your containers. There’s no need to add a completely new potting mix. Rather, incorporate about a third of new compost or manure and a little perlite (it helps with the drainage, ensuring that roots won’t end up standing in cold water) if you have it to hand. I’ll also be adding a slow-release fertilizer (just an inorganic B&Q one) so that I don’t have to worry about intermittent feeding as the lettuce grows, although adding a liquid feed at weekly or bi-weekly intervals is perfectly adequate. If you’re starting from scratch, consider amending your initial potting mix by adding perlite. They like a somewhat moist and nutrient rich soil so you might also want to consider including a high-nitrogen fertilizer. Nitrogen is responsible for leafy growth, which is obviously something to be encouraged with lettuces. Manure, fish meal and blood meal all contain high levels of nitrogen. Plants will benefit from some protection from September onwards. I’ve made my own cloches out of polythene sheeting, bamboo canes and wire ties…it’s not a particularly difficult DIY project if you have the inclination. Otherwise, there are lots of cheap products that you can buy online. Amazon, for example, sell low-lying polythene “tunnels” that are both inexpensive and effective. The loose-leaf and butterhead varieties lend themselves particularly well to a cut-and-come-again approach. Leaves grown through autumn and winter tend to be smaller and richer in taste, so manage your pickings for a consistent supply. Pull the crisp-heads in one go. 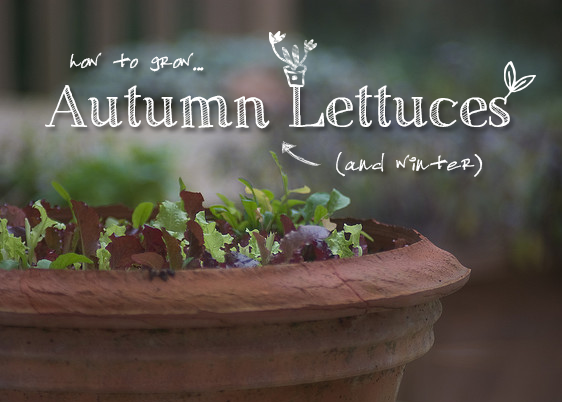 Lettuces comprise only a sliver of the broad range of veg that can be grown through winter. I’ve just bought my September issue of Grow Your Own and it’s come with two seed packets, Radicchio and Mustard Spinach, that I’ll also be planting out. I think I’ve got some winter radish seeds hiding somewhere too. Very informative blog post. Thank you!